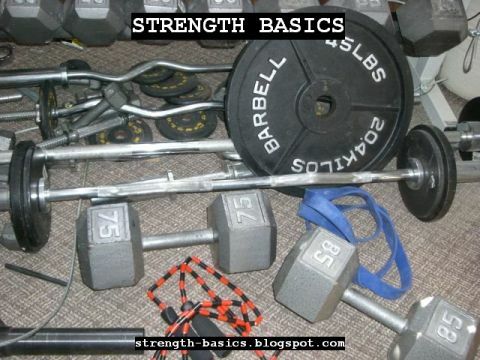 Strength Basics: What is your strength for? Broadly, you can make this, "What is your fitness for?" Or you can narrow it down to "What is your speed for?" or "What is your bench press for?" or whatever. What applications of your strength really matter to you? Which ones are useful in the crunch? I had an email exchange with a friend earlier today about his real-world functional strength. I said, "this matters when you're under a load, like with a squat or carrying your wife out of a burning building." Not saying his (or anyone's) spouse is a "load" in a negative sense, but just making a point. Picking someone up when you need to is showing your strength. It's adding an unstable load to your body and then asking you to move. Can you do that? Is that what you want to be capable of? And if so, is that what your training is doing for you? What kind of demonstration of strength are you training for? For me, it started out as aesthetics. I wasn't strong or fit-looking when I started out. I wanted to be. I liked how I felt when I was training and I liked the results of training. Then it changed to MMA. If I could demonstrate my strength on the mat at practice or in a match, I was strong. My training helped. It mattered. How I looked wasn't a big deal, if I could make weight and keep strong opponents from pushing me around. Nowadays, it's still for MMA. But it's also for the gym - can I do the exercise with good form and show people what to do? I'm a trainer, after all. And last but not least, it's for the "carry my wife out of a burning building" situations. I'm willing to suffer a lot of pain and injury to do that, if that's what it takes to succeed. I train partly because I want the strength to ensure I succeed. A cranky knee or shoulder is annoying. But a weak one that'll give out when I fireman's carry someone from danger is a disaster. This is a larger issue than goals, or "What are you training for?" Ask yourself, what ways of using my strength, my fitness, my mobility, my speed are important in my life? What real world situations do I want it to truly matter in? Are you getting better at those? Is your confidence that you could shoulder your spouse or child and kick down a door and escape a disaster high? Are you sure you could run away from an attacker and stay away? Are you sure that when it comes to help move your friend out of his house, you can lift that TV by yourself? Whatever it is - dramatic or prosaic - that's what your strength is for. It's worth thinking about and knowing.